Byzantium is old, Byzantium is civilised, Byzantium is a nest of vipers. The Roman Empire of Byzantium considers itself to be the same state as that in which Julius Caesar and Scipio Africanus lived and loved and fought and died. It has been ruled by kings and consuls and emperors for almost two thousand years. Of course there have been some changes in that time: the capital has moved from Rome to Constantinople, the people and their rulers have abandoned their pagan ways and found the truth of the Orthodox faith, and the language of the empire has switched from Latin to Greek. But to a citizen of Byzantium it is a story of continuity and permanence. A Byzantine sweep-cleaner can trace his roots back to before the founding of the neighbouring kingdoms, let alone their upstart royal families. The Empire was here a thousand years ago, it will remain a thousand years hence. Byzantium remained a shining beacon of civilisation as all over the rest of the world the lights went out, as Rome fell and the ancient cities of Gaul and North Africa shrank away, to be replaced by illiterates who spoke the barbaric tongue of Arabia or debased descendants of Latin. Those places have crawled their way back to a semblance of civility and knowledge, but the great libraries and churches of Byzantium have stored away all the knowledge they have forgotten. Byzantium is the perfect faction for those players who enjoy a little political scheming and complexity. (There's a reason for the word “byzantine”, or at least there is in this game!) Of course, it can be good to play against type and play Captain Carrot. Those aren't the only options. Byzantium is a good choice for archivists and historians, given its great weight of history and its connections to the past. Constantinople is a great crossroads of trade too, where the Silk Road finally reaches Europe. And the Roman Empire of Byzantium always needs more soldiers and generals to defend its borders. Perhaps a new Belisarius will arise to expand the Empire to its ancient boundaries. Subjects of the Roman Empire of Byzantium are followers of Eastern Orthodox Christianity, and members of the Orthodox States faction. Byzantine characters start with a +1 bonus to either their Diplomacy or Bureacracy skill. This means that the first rank of the chosen skill comes free - if you wish to have the skill at a higher rank, it simply costs one point cheaper. Byzantine characters have access to alchemy, as well as hedge magic and witchcraft. –Robert of Clari, a French crusader. An ancient Empire recovering from an age of weakness, growing once again in confidence and power. Almost a thousand years ago now, the last Roman Emperor of the Undivided Empire ordered the founding of the city of Constantinople and moved the capital of the Empire there. Under his successors the Empire was divided into the Western Empire ruled from Rome, and the Eastern which continued to be ruled from Constantinople. In due course the barbarians overran and destroyed the Western Roman Empire. Thereafter, Constantinople became in truth the largest and wealthiest city of the Roman Empire and of the world. Since that time the size and power of the Empire has ebbed and waned. In the time of the Emperor Justinian, in the 6th Century, almost the entire Mediterranean was Roman once again. A mere century later the Empire had shrunk once again to the Eastern Mediterranean and was locked in exhausting war with the Persians. In the space of a single lifetime the ancient Persian empire was annihilated and great swathes of the Roman Empire lost as hordes of riders swept from the desert of Araby, conquering all before them in the name of of Islam. For five hundred years now the story has remained the same, though the actors have changed, as one or a dozen Islamic successor states vies with the Byzantine Empire for control of Asia Minor, the Holy Land and the rest of the Middle East. At the same time rebellions in the north have seen the Romanians and Bulgarians independent or reconquered a dozen times over. At times the borders of Byzantium have shrunk almost to within sight of the walls of Constantinople. In 1185 the Roman Empire of Byzantium is once again near the height of its recent power: all of Greece and half of the Black Sea are once again ruled from Constantinople, and the southern borders reach to the edge of the Holy Land and the Crusader States. The Seljuk Empire, the most recent Islamic State that sought to overthrow the Empire, is failing and falling like so many before. In 1095, at the Council of Clermont, Pope Urban II proclaimed the First Crusade. Ostensibly at the request of the Emperor of Byzantium who sought reconciliation with the Roman Church, the emperor expected little more than a few companies of mercenaries. Instead the armies of the Latins marched east. Initially this alarmed the Emperor and his courtiers immensely. Byzantium had fought for decades against the Norman princes who led the Crusader armies, and the armies themselves were like a hungry plague that consumed everything in their path and threatened to beggar the Emperor and his subjects. Nonetheless the Crusader army arrived at Constantinople and there its leaders swore oaths of homage to the Emperor of the Roman Empire of Byzantium whilst the city's alchemists treated their illnesses and weariness. In return for transport and supplies on the march the Crusaders would return their conquests to the Byzantine Empire. At first all went well and Crusader victories at Nicea and Dorylaion allowed the Byzantine forces to recover much of western Asia Minor. At the Siege of Antioch the Westerners showed their true colours. As the Crusader forces rampaged through that ancient city in fire and sword, Bohemund proclaimed himself “Prince of Antioch” and repudiated his oaths. The Crusaders fought for themselves alone and after the massacres in Jerusalem founded their own midget kingdoms in territory rightfully belonging to the Emperor. Recent Byzantine history has been complicated. Emperors come and go with alarming frequency in a welter of coups and conspiracies. Take the example of Andronikos, the previous emperor. Exiled from Jerusalem for seducing Princess Eudoxia and plotting against the Emperor, in Jerusalem he instead seduced Theodora, the widow of King Baldwin III and the Emperor's niece! He and his new mistress, and her children, fled to the Islamic States before she was captured by Byznatium. To obtain their release Andronikos grovelled before the Emperor in chains, besought pardon and was banished once more. Later that same year (1180) the Emperor died and was succeeded by his ten year old son Alexios II, with his unpopular Latin mother as regent. Riots ensued and Andronikos led an army - including Muslim contingents - to a Constantinople virtually in civil war. The city was taken and Empress Regent poisoned and Alexios reported killed. In the riots that resulted the “Massacre of the Latins” saw 50,000 traders and immigrants slain or fled in terror and poisoned relations with the Western Kingdoms. The Byzantine Empire is run by a complex mechanism of officers and bureaucrats and monks, all vying for authority, all shirking responsibility. But ultimately the two chief powers are the Emperor and Patriarch in Constantinople. Both Emperor and Patriarch reside in the great walled city of Constantinople; the Emperor in the Great Palace, the Patriarch in the enormous Hagia Sophia (the Church of the Holy Wisdom). In theory the Emperor is the temporal ruler and Patriarch the spiritual, but in truth the two realms of power are too intertwined to be simple divided. But it is the Emperor who wields the greater power of the two, in fact it is the Emperor who all but appoints the Patriarch. Isaac Angelos has been Emperor of Byzantium for only a handful of months. Having already led one revolt against the previous Emperor Andronikos I – and having uncharacteristically escaped with his life from its failure – he bided his time in Constantinople while the Emperor grew increasingly unpopular. What hand Isaac had in the growing unrest is unclear, his twin reputations for laziness and duplicity clouding the issue, but whilst Anronikos was out of the city the courtier Stephanos Hagiochristophorites attempted to arrest Isaac. The city rose in revolt and Isaac took the crown in the chaos. Isaac handed Andronikos over to the city mob and for three days he was exposed to their fury and resentment, remaining for that period tied to a post and beaten. His right hand was cut off, his teeth and hair were pulled out, one of his eyes was gouged out, and, among many other sufferings, boiling water was thrown in his face, punishment for his handsomeness and womanising. But on the third day a choking mist rose from the ground and when it suddenly lifted Andronikos was gone. Rumours grow wild that he stalks the city looking for revenge against those betrayed him while others confidently report that he has fled to a distant monastery. The reign of Isaac II Angelos has begun with mixed success. Bulgaria is in revolt and an ill-judged attack upon the Crusade Kingdom city of Acre, to rescue his brother Alexius from prison, was destroyed by a Latin fleet before it reached the city. To the west however the Latins have received a decisive defeat in their encroachment upon the Balkans. In the Imperial Palace the Emperor surrounds himself with slaves, eunuchs, mistresses and flatterers. And somehow Stephanos Hagiochristophorites emerged from the riots to whisper poison constantly in the Emperor's ear. 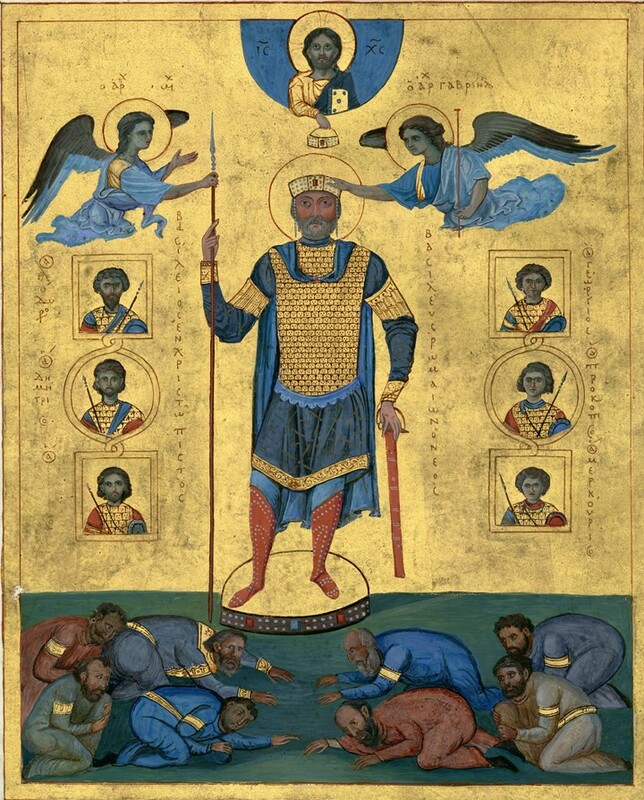 Young to the post, Basil II succeeded the previous Patriarch only this year. He has had little time to put his considerable authority to use, and is still regarded as an unknown quantity by the Emperor's courtiers. From the ancient Christian city of Nicea, he is known as a great opponent of Islam and truck with the Muslim states. More importantly, he has already preached sermons against the Crusader states which have “usurped” the Holy Land. The current royal family, the Komnenian, inherited the Empire when it had reached its smallest territorial extent. The Empire wavered at the edge of oblivion, its long history almost at an end. But the Komnenos Emperors reformed the army and built it once more into a professional disciplined force. The most famous individual units are the Varangian Guard and the Immortals (heavy cavalry), though it is perhaps the Kataphraktoi cavalry levies from Greece which are best known in the West. The Empire disdains its neighbours' concepts of “Jihad” and “Crusade”, they are either gross perversions of scripture or simple excuses for looting and destruction. Emperors and generals alike believe war to be a failing of governance and diplomacy, to be avoided whenever possible. An able ruler only wages war defensively or to avenge a wrong, and in such cases God will protect the just. A cunning ruler uses the tools of the statesman to acquire what he needs by persuading enemies and friends alike to give them to him. A powerful secret of alchemy known only to the Byzantines, and used primarily by the navy, Greek fire is a substance which will burn even on or beneath water and is impossible to extinguish by any means but time. Even a small amount on the skin will burn its way right down into the bone. Some claim it was first created by a philosopher from Athens called Proclus, who invented a powder that ignited when exposed to the heat of the sun's rays. Whatever the truth is a deadly weapon, but unwieldy, used only by warships, and at sieges by Byzantine defenders or hurled by trebuchets. The Varangian are a fierce people from the very north of the world, even past the homeland of the Rus. They are distinguished by their great beards and greater laughs, which are said to crack trees in the endless winter of the lands they call home. Once they were raiders, then mercenaries and traders, now the best warriors serve the Emperor as his personal guard. A steady supply of money and their poor grasp of Greek means that they serve the Emperor most loyally, and play little part in the games of the court. Before the Muslims came the Holy Land was ruled by Byzantium. When the Crusaders came they promised that they fought to return it to Byzantium. The Holy Land is rightfully the territory of Byzantium. But the Roman Empire is in no hurry; time will defeat the squabbling petty kings of the Catholics and the rival emirates of the Muslims more certainly than armies, if more slowly. Nikephoros Bryennios - A general and historian, he stood upon the walls of Constantinople in the darks days when it seemed that the First Crusade would wash away Christianity in the East rather than strengthen it and helped defeat the Seljuk Sultan of Rum. He wrote the first great history of the new Komnenos Dynasty. Joanna Zonaras - a theologian of some note, who has written a history of the world since the creation and a commentary on the lives of the saints, she is more well-known at Court in her role as commander of the Imperial Bodyguard and private secretary to the emperor. Stephen Hagiochristophorites has been a courtier of growing power for thirty years. His last name literally means “Holy-Christ-Bearer”. Stephen had his nose cut off and was expelled from court as punishment for attempting to seduce a noblewoman. He returned to favour under Andronikos I Komnenos; nicknamed Antichristophorites (literally meaning “bearer of Antichrist”) his reputation as a blackmailer and spymaster is dark beyond belief.